I have heard it said that Baby Boomers don’t want to grow up. We want to feel young and carefree as we continue to live life to its fullest. I spent time leading up to the 4th of July playing volleyball in a lake in Wisconsin with a group of friends. The net is literally set up in the lake. Classic fun! I experienced Santana in concert – for two+ hours, under the stars. Carlos is fantastic – he’s still rocking – making it fresh and real after all these years. He plays with a large group of musicians, and they know how to do it right. I got behind my husband on our motorcycle for the first time in many years. 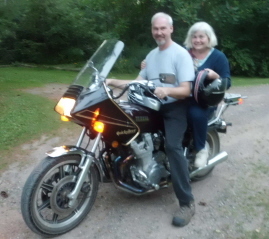 He recently had our Yamaha 1100 revamped and has begun to ride it on nearby country roads. I have been writing my motorcycle memoirs, Traveling Together, Cliff and Me and the Motorcycle Makes Three, and it brought back the memory of soaring down the road on a bike. I tried it and I liked it! What are you doing that shows your rockin’ spirit? Hi! I think all of our Rockin’ Spirits take a break once in a while… glad to see yours is reawakening! I am looking forward to checking out Trixie’s adventures. Thanks! You’re looking mighty fine on the back of that bike… Keep on rockin’ and giving us some major inspiration! Thanks! And right back at ya — I check in on your site often for inspiration to keep on rocking! on August 27, 2012 at 9:18 pm | Reply Lynne P.
Thanks for sharing your wonderful experiences. You have much to offer. You are very talented! Thanks, Lynne. All the best to you!